2. Boston Mk.llla of the 88 Squadron, 2 nd TAF, RAF.Crew commander - Squadron Leader Dzh. R. Pushmen, Hartford Bridge. 3. 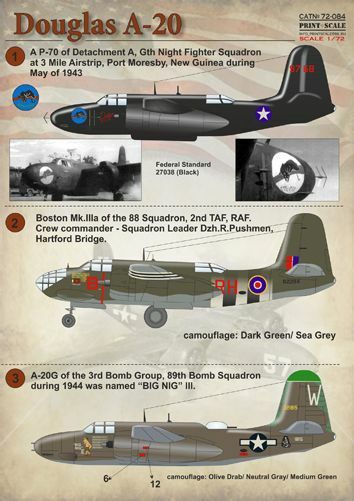 A-20G of the 3rd Bomb Group, 89th Bomb Squadron during 1944 was named "BIG NIG" lll. 4. Douglas Boston lll Al290:OM-K of No.107 Squadron, Great Massingham, April 1942. 6. Douglas Boston lll Z2221:OZ-F of No. 24 Squadron South African Air Force, Western Desert Late 1942.